Click the tab to view the Tournament Sheet. Build the teams and select the trial you want to use. 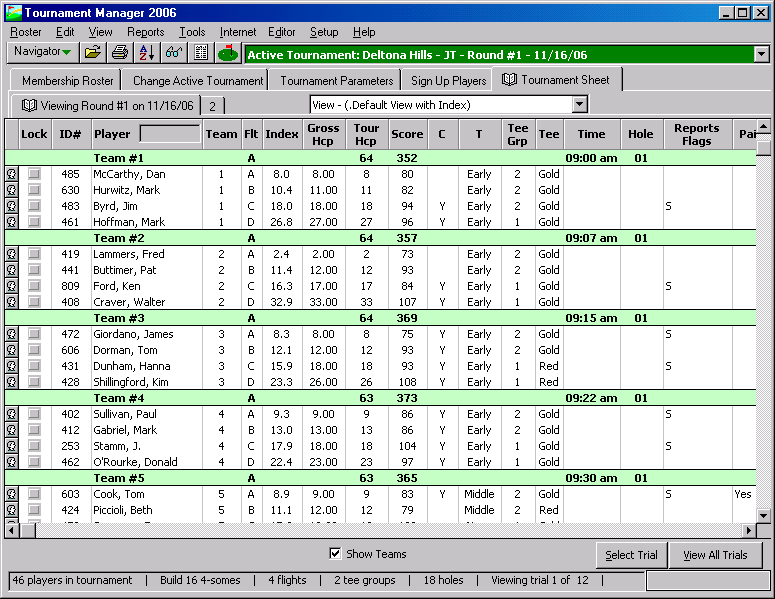 Print scorecards or pairing reports. These steps are accomplished in the Tournament Sheet. Note: If you do not see the same columns in this sample screen, pull down the View menu, click Custom Views and load the Default View. Lock - Indicates that a player is locked on his current team. Press the spacebar to lock\unlock a player or simply click the check box. Team - Displays the team the player is on. Flight - Player's current flight. Gross Hcp - This is the player's gross handicap before any adjustment for handicap allowances or handicap adjustments. Tour Hcp - The player's tournament handicap. Score - Score the player shot. Cart - Indicates if the player requires a cart. Pref Time - Preferred Time. Time golfer prefers to play. Early, middle, late, or no preference. Tee Grp - Player’s current tee group. Tee - Tee color golfer will play. Report Flags - Indicates if the player is "flagged" to appear in certain reports.